Recently, I wrote a post featuring some of the music I listen to while I run. Now, we are going to delve into some of my favorite running and health & fitness podcasts. While running, I normally listen to music. However, there are some exceptions. There are a handful of podcasts that hold my attention while running, which makes the run go by much faster and better. I have been listening to podcasts for about 10 years. However, I did not listen to any running podcasts until I made the decision to go on my 50 state journey. Boy, was I missing out all this time! There are some really fun, educational, and positive running podcasts out there. 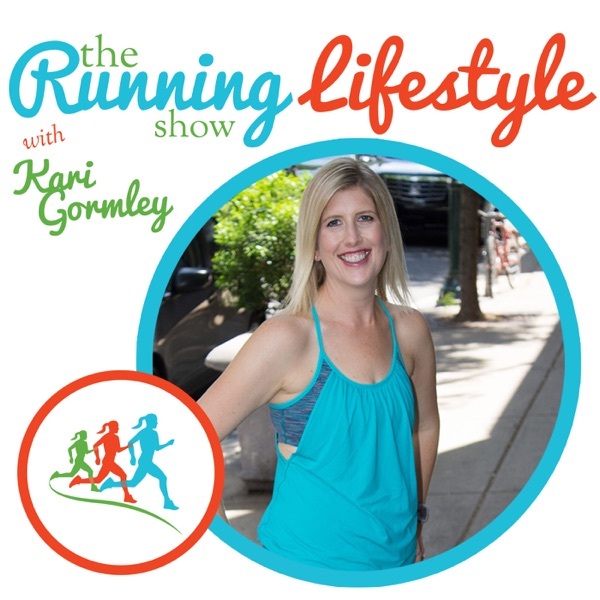 We will start this series with one of my favorites – The Running Lifestyle Show with Kari Gormley. This is such a great podcast for all types of runners. Whether you’re new to running, or have been doing it a while, whether you just jog around the neighborhood, do 5K’s or marathons, this is the podcast for you! There is a variety of great topics, and superb interviews with interesting people in the running community. A typical episode contains a featured interview, then an interview with a runner of the week. Then registered dietitian, Serena Marie, comes on to give some awesome food tips. There are a few reasons I love this podcast so much. First of all, I love the sound quality. There are a lot of podcasts out there that use crappy microphones. I don’t listen to them for very long. Kari always sounds great, and during many interviews, it sounds like both people are in the same room. Kari also has a great personality, is down-to-earth, and is a lot of fun. She brings out the best in her guests, and you can tell that they enjoy talking with her. There is always a lot of good chemistry between Kari and each of her guests. Then this is amplified when Serena, Kari’s “sister from another mister” comes on! Serena takes what could be a dry topic (trust me, I’ve fallen asleep through many health classes in high school) and make it fun and interesting. And she gives great nutritional tips that everyone could use. I had the privilege and honor of interviewing both Kari and Serena. A. I started running consistently in 2011, after an off again on again love affair with running (like most people). In 2006, I had run the Chicago Half Marathon severely under-trained (trained up to a whopping 4 miles) and I remember the sense of achievement and runners high. I wanted to get back to running and to have that feeling again. A. Oooh, SUCH. A. HARD. QUESTION 🙂 It would have to be the NYC Marathon because of the people, and because of all the hard work with fundraising and training that went into it. Q. Why did you decide to podcast? Were you listening to other podcasts that got you interested in doing one yourself? A. I had been listening to podcasts for three years, and they had changed my life in such a positive way. I wanted the opportunity to meet interesting people and “pick their brains” as a way to keep on running and integrate it into my lifestyle. Q. When you interview Oprah (and I know you will) do you have any specific questions you want to ask her, that you would like to share here? A. Thank you, Paul. Say it to Create it! I want to know why she does what she does. Why she wanted to run the Marine Corps Marathon. What has been some of her biggest lessons in life? What does she want her legacy to be? Why does she keep on working? When will she run another marathon? Why she chose to buy a large amount of stock in Weight Watchers and how does she like being on the program. Q. Do you have any other dream guests? A. Deepak Chopra, Gretchen Rubin, Deena Kastor, Martha Beck, Jay Leno, The Brand New Heavies (love their music and especially their song, “You are The Universe“), Michelle Obama, Bill Clinton, and Ellen DeGeneres. A. Yes, I have met so many inspiring people. Everyone has a story. As I like to say, Every Body is different. Some of the most inspiring people I’ve seen on a race course where the Achilles Runners at the NYC Marathon. Q. Along that same track, who are some of the most inspirational people you have interviewed on your podcast. A. Every runner that comes on the show is inspiring. The people who come to top of mind are Dean Karnazes, Meb [Keflezighi], Kathrine Switzer, Jeff Galloway, Melanie Curtis, Tera Moody, Rhonda Foulds, Vicki Huber Rudawsky, and many many more. Q. Do you have anything coming up on The Running Lifestyle that you would like to share? A. Look forward to more interviews that focus on health creating wealth, and not necessarily wealth meaning money, but wealthy in terms of life changing experiences. A. I am very grateful to the listeners of The Running Lifestyle Show and to be “running” with them. It’s a privilege to podcast and to be able to lead an active life. A. I have been running since I was 14 years old. I started running as a means to lose some of the pre-pubescent body fat that many little girls develops as they enter their teenage years. However, after joining my highschool’s cross country team and being introduced to the comradery of running; I was hooked for life! A. My favorite race is ABSOLUTELY the DC Rock n’ Roll Half Marathon. It was pouring rain, fuh-reezing and totally miserable outside, but I had the chance to spend the whole weekend with some of my best friends and I also PR’d, so it was an incredible experience in the end. Q. How did you get involved with The Running Lifestyle podcast? A. Life took me by the horns! I was working as a supermarket dietitian and struck up a conversation with a stranger wearing a running shirt. Turns out, that stranger was one of Kari’s friends, a guy named Tim! Tim introduced Kari and me because he knew Kari was starting a podcast and looking for a dietitian to be on the show. Q. To me, it seems like I’m beginning to see more and more organic products on the shelves. Do you think more people are finally becoming aware of GMO’s? A. I definitely think GMO/organic/real food is starting to permeate the scene; especially on the coasts. Q. Have you come across some common misconceptions people have about healthy eating? A. Common misconceptions include red meat is unhealthy, juice is good for you and whole grains are the best source of fiber in the diet. Truly, red meat can be a great source of protein & healthy, anti-inflammatory fat when from a grass fed animal; juice is purely a sugar source and whole fruits/veggies are the WAY TO GO; and whole grains pale in comparison as a source of fiber when compared to veggies (especially cruciferous veggies!). Q. In your practice, do you see any common pitfalls people have for not eating healthy, and do you have any advice on how to get back on track? A. By far, the most common pitfall, is self-doubt/guilt/negativity!! I emphasize to all my clients that PERFECTION IS NOT ATTAINABLE! And that’s A-OK! We have the rest of our lives to make healthy choices; its expected that there will be days where you won’t make the healthiest choice…but its important to aim for a diet rich in vegetables, lean protein & anti-inflammatory fat MOST of the time in order to balance those “less perfect” days. If you have a day/few days/few weeks where you find yourself establishing unhealthy habits; its important to SHAKE IT UP! Use a calorie counting application such as My Fitness Pal, have a friend hold you accountable, strip your cabinets/fridge of nutrient poor foods… shake it up by replacing less-healthy choices with healthy choices. Also…adequate sleep is of the utmost importance for staying on track with healthy diet. Q. Do you have any final thoughts you would like to share? A. Some peope already know which are the best tools for achieving a healthy weight and its their motivation that needs some pep-talking; while others truly need the 411 on how to eat healthy. No matter where you are in your journey, my blog (SerenaMarieRD.com) is an awesome resource. Many times people ask what’s my number one tip for nutrition. Unfortunately, since each unique person will have unique qualities about their journey/body/exercise regimen, I cannot give one golden tidbit that will instantly help everyone achieve their goal. However, I can say without a doubt that increasing how many veggies you eat daily can only lend you ROBUST health. Sip on veggie smoothies at breakfast, double the size of your salad at lunch, sautee a huge serving of veggies to serve at dinner… veggies are the master of health. Booyah. Aren’t they awesome?!?! Thank you so much, Kari and Serena, for taking the time to answer my questions! So everybody, please check out the podcast and let us know what you think. You can get the podcast from Kari’s web site, The Running Lifestyle, or you can subscribe through iTunes (like I do) or Stitcher (yep, subscribed there too, just in case). She is also on Facebook, Twitter (@therunlifestyle), and Instagram. Serena’s web site is SerenaMarieRD.com. She can also be found on Facebook, Twitter (@SerenaMarieRD) and Instagram. Thank you for reading, and until next time, I’ll see you out on the Rhode!